It's easy to imagine a future zipping around town in your mobile hotel-bus-office or pretending you're in space while you soak inside your zero gravity bathtub, all while a robot reads to your kid. But let's get back to 2018 for a minute. CES is in full swing in Las Vegas, and the annual technology trade show is again striking the usual balance between futuristic tech that is years away and the practical, such as artificial intelligence for the home. Toyota showed off a self-driving vehicle called the e-Palette, but it isn't your traditional driverless car. The vehicle has no seats and no windshield. The e-Palette is being developed in partnership with Uber, Amazon and Pizza Hut. In one example, the e-Palette could be used to deliver packages, with a robot unloading a parcel and taking it to a customer's door. It could also serve as a mobile store, office and way to commute around a city. Self-driving cars are cool, but what about self-driving motorcycles? Yamaha's concept motorcycle, MOTOROiD, made its U.S. debut at CES. It's semi-autonomous, and its artificial intelligence also allows it to recognize its driver and interact — though it's likely you won't want to take a nap on this motorcycle. Along with gasoline and human drivers, car sickness could also one day be a relic of the past. A road mapping demonstration showed how ClearMotion, an automotive technology company, used its active suspension system to help vehicles adapt to their terrain. The idea is to get rid of all the bumps and create a smooth ride where people could, ideally, not get sick and have no problem multi-tasking as their autonomous vehicle drives them to their next destination. ClearMotion is aiming for a 2019 launch date. Amazon's Alexa was the star of the show last year, and this year, Google is playing catch-up with its artificially intelligent assistant. "The biggest theme I have seen so far is the further addition of the connected intelligence to appliances," said Moorhead. "This is tech speak for making appliances like TVs, refrigerators and vacuums controllable by voice and to work together. Samsung, Amazon and Google are all competing for this space." You couldn't miss Google's presence at this year's show — from the signs at the airport to the advertising wrapping Las Vegas' Monorail. There are updates to Android Auto to rival Alexa, which was recently announced as coming to Toyota cars. 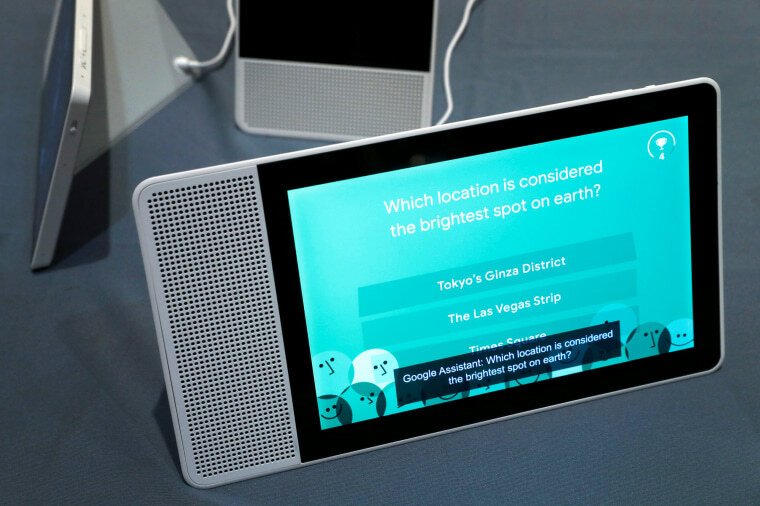 And Google Assistant is also compatible with four smart displays, providing a screen for Google's intelligent assistant that's worth rivaling the Amazon Echo Show. While there's plenty of practical tech, the charm of CES arguably lies in the potential of what we can expect in the future. After cruising the aisles of CES this year, it's clear that one day, some of us may want to welcome a robotic family member into our homes. They're great for security, teaching, chores — and even companionship. One year after showing off a prototype, Intuition Robotics brought its latest version of ElliQ to CES. The sociable robot is geared toward the elderly. It can take calls, read emails, and even give reminders, such as when it's time to go for a walk. Intuition Robotics announced it will be starting a beta program for the elderly, in California and Florida, before launching later this year. The tech world clearly believes that everyone — no matter their age — is going to want a robot. Luka, an adorable robot from China's Ling Technology, an artificial intelligence company, is making its American debut at CES. The cute robot, which is geared toward children, comes to CES after selling more than 30,000 units in China. A release date hasn't been set yet, but American consumers can expect a sweet robot that can read to your kid at his or her pace. it will track their progress and even throw in a few Chinese songs to help give them an edge, à la Arabella Kushner. And if you can't have a pet pooch, perhaps you'll settle for a robotic one. Sony showed off a new Aibo toy dog, which happily wagged its tail at CES. While they were clearly the most popular dogs in the convention hall, unfortunately they're not so easy to adopt, since they're currently only on sale in Japan. Televisions seem to impress year after year, and the talk of the show so far is Samsung's "The Wall," a 146-inch modular television. Patrick Moorhead, principal analyst at Moor Insights & Strategy, said it was the "coolest" thing he's seen so far at CES. "Samsung hasn’t even priced this out yet, but it will likely be tens of thousands of dollars," he told NBC News. LG also wowed with its 77-inch W8 OLED television. At less than 3 millimeters thick, the television literally looks like it's wallpaper. LG hasn't announced a release date yet, only promising that it's "coming soon." Keeping with the trend of having Amazon's Alexa or Google's assistant in almost everything, one standout audio product this year was Polk's Alexa-integrated Command Bar. The home theater-quality sound bar will be available sometime this spring for $299.95. Workhorse's SureFly passenger drone was set to make its big debut flight at CES, but was ultimately grounded after several days of hard rain. The electric-diesel hybrid could one day make it easier for people to take to the skies. The target price per aircraft is $200,000. Tech also went in the toilet. Literally. With Kohler's new toilet, which is set to be available later this year, you can do your business and then ask Amazon's Alexa to flush. Having the luxury of a toilet that lifts the seat on command isn't cheap, though. The toilet is set to start at $5,625. Then there's the bath tub that wants you to feel like you're in space. Toto unveiled a luxurious, zero-gravity bathtub that takes bathing out of this world. Pricing and availability are, in classic CES fashion, still being determined. And as everyone packs up and leaves CES, chances are they may be sick of carrying around their luggage. They won't have to in the future, thanks to Forward-X, a suitcase that, quite literally, follows its owner wherever he goes. Perhaps the best part? The personal porter doesn't even want a tip.